Members and visitors at the DDG Board meeting in Santo Domingo on February 16, 2015: Front row, from left: The Rt. Rev. Dabney Smith (Southwest Florida), The Rt. Rev. Wendell Gibbs (Michigan), The Rt. Rev. Julio Holguín (Dominican Republic - First Vice-President); Virginia Norman (Dominican Republic - Treasurer), The Rt. Rev. William Skilton (Dominican Republic), The Rt. Rev. Todd Ousley (Eastern Michigan), Bill Kunkle (Executive Director). Back row: The Rev. Deacon Alexander Romero (Dominican Republic), David Morrow (President), Sally Thompson (Southwest Florida), Karen Carroll (Dominican Republic), the Rev. Tar Drazdowski (Nebraska), the Rev. Deacon Bob Snow (Nebraska), The Rev. David Somerville (Georgia), the Rev. Emily Griffin (Virginia), Joy Holl (South Carolina), Elizabeth Welch (Central Gulf Coast), the Rev. Deacon Beth Drew (Western Michigan - Secretary), Julia Ariail (Georgia), Julius Ariail (Georgia). 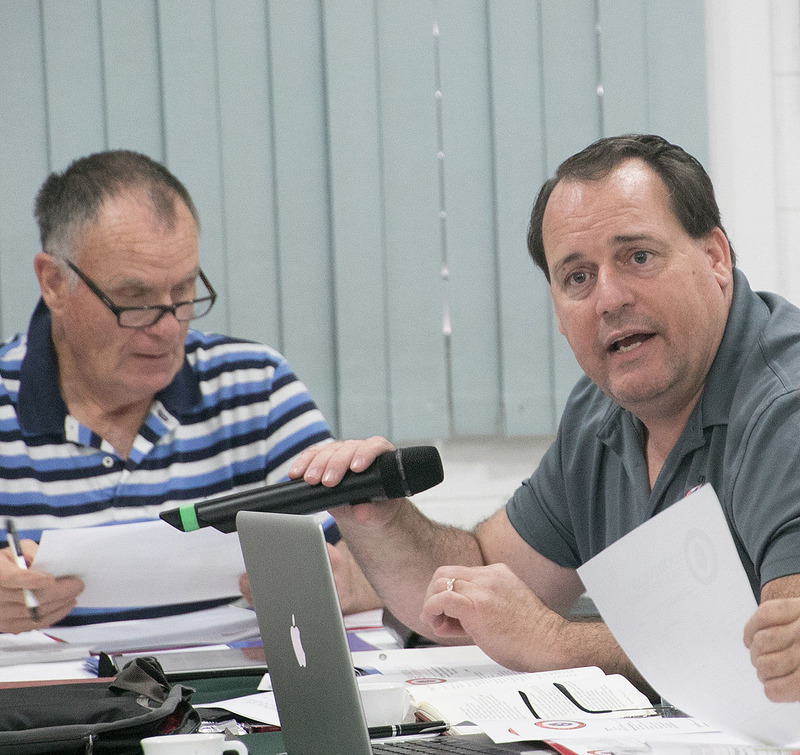 An album of photographs from the board meeting on February 16 is here. An album of photographs from the Dominican diocesan convention from February 13-15 is here. For information on activities of the DDG board members during February 13-17, 2015, click here. The minutes of this meeting are available here. The Dominican Development Group held its semi-annual meeting on February 16, 2015, in the office of the Diocese of the Dominican Republic. 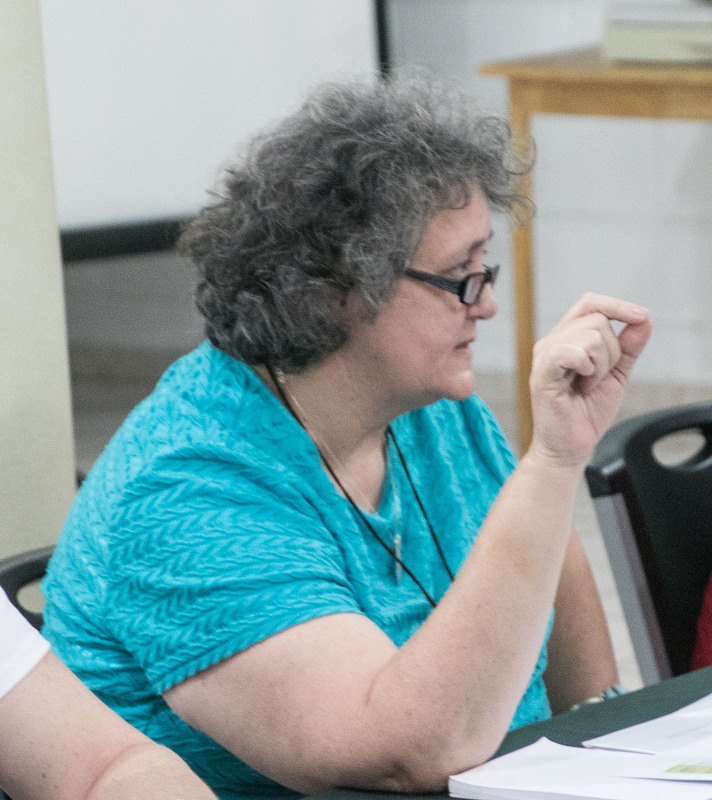 Sixteen board members including five bishops from companion dioceses, five bishop’s representatives and six members at large attended the one-day meeting along with several guests. 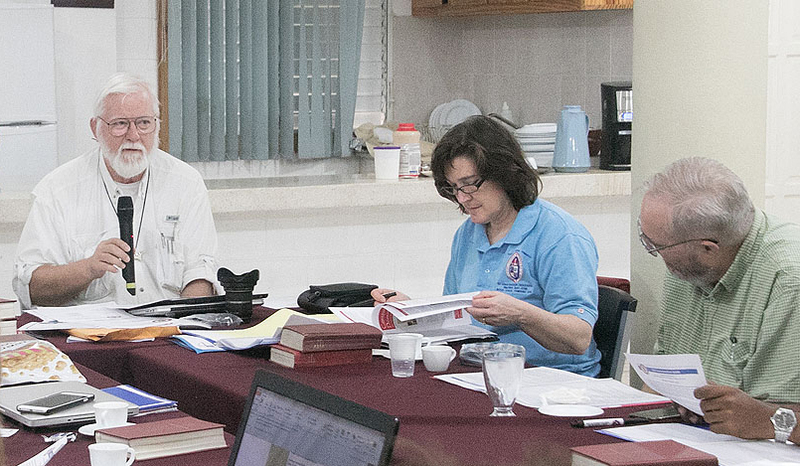 Following Morning Prayer, the agenda for the first business session included a call to order, the confirmation of a quorum, the introduction and presentation of guests, the minutes from the October 2014 meeting, the presentation of the revised 2015 budget, the confirmation/election of officers, reports by Bishop Julio Holguín and DDG President David Morrow as well as open discussion and the 2015 committee formation. The DDG board meeting in session on February 16, 2015. Soon after the start of the meeting, Executive Director Bill Kunkle presented gifts to Bishop Wendell Gibbs and his wife, Karlah, in recognition of their hospitality in hosting the DDG meeting in Detroit, in October 2014. Significant elements of Bishop Holguín’s report highlighted several issues of the life and work of the Diocese of the Dominican Republic. Fourteen priests and deacons moved to new assignments in the past six months. With the help of many mission teams, Bishop Holguín hopes to dedicate six new mission churches in 2015. If this happens, it will be the largest number of churches consecrated in a single year in his episcopacy. The sports court and playground at the Laura Morrow School in Jimani are in the final stage of construction. Bishop Holguín hopes to initiate the Santana Convention Center in June 2015 to be used for meeting and retreats for the South Archdeanery as well as to accommodate mission teams who go to that area to work. Bishop Holguín told the group that thanks to generous donations received via the DDG, the diocese finished several construction projects on schools and churches that had been waiting for completion for several years. Bishop Holguín presenting his report to the board. Bishop Holguín described the election process for a bishop coadjutor. At the convention held the weekend before the meeting, the Search and Nominating Committee presented three priests as finalists for the position. There will be an open period in March for nominations of other finalists by petition. On Saturday, July 25th, 2015, the convention will reconvene for the coadjutor election. He asked for prayers for the diocese in discerning the best choice. From left: Bishop Dabney Smith, Bishop William Skilton, and Bishop Julio Holguín. 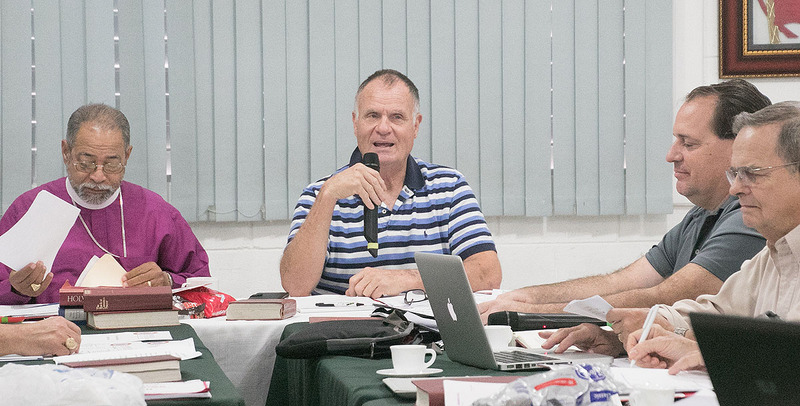 During the discussion of Bishop Holguín's report and at other times during the meeting, Bishop Skilton served as translator. The endowment financial report (FOCA) was presented the previous evening at dinner. The proposed one-time payment of $950,000 from The Episcopal Church has not been received as of now. This payment would replace the annual subsidies from The Episcopal Church, and when received will be invested in the endowment account. The diocesan office will continue to communicate with The Episcopal Church to determine what is next in the process. Bishop Holguín thanked the DDG with his deepest gratitude for our support and trust in supporting our shared mission, all for the honor and glory of God. 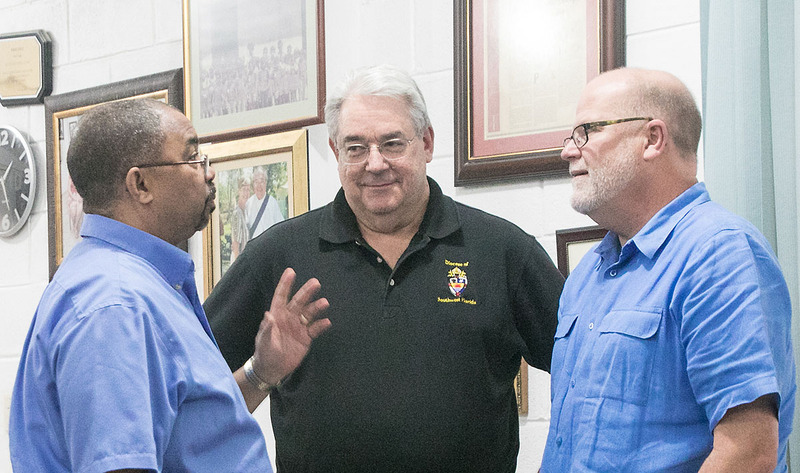 In his report, President David Morrow described the two most important functions of the DDG as fundraising for the Episcopal Diocese of the Dominican Republic and administrative support to both Bishop Holguín and Executive Director Bill Kunkle. In reference to the technical schools now in the development process, President Morrow said there are no licensing issues for the certificates being offered by the schools. As the program evolves into degrees, we will seek accreditation. There is no certification required by the state for beauticians or electrical workers, two of the first programs proposed in the schools. The government is supportive of our efforts since there are not enough public technical schools to meet the need. In particular, non-traditional students are not being served. Bishop Holguín said that we need vocational schools to teach trades to support the expansion of the middle class. From left: DDG President David Morrow presenting his report to the board. The public schools operated by the Dominican government have improved recently, and the government offers the public incentives to attend them. This creates challenges for the Episcopal schools. We discussed the plight of the resident Haitian children. In the DR all children are allowed to attend school through the 8th grade but must have documents of citizenship to attend high school. However, the resident Haitians could attend our technical schools without citizenship documents, and this might present a path for expansion of the technical school programs and for the generation of additional financial support from the companion dioceses for them. Missions Team Coordinator Karen Carroll. During the second business session, Mission Team Coordinator Karen Carroll reported that 54 mission teams are scheduled for 2015: 12 VBS teams, 13 medical teams, and 29 construction and repair teams. This is an increase from 2014 and includes several new teams. The list of incoming mission teams is now being relayed regularly for posting on the DDG website. Emily Gibson is a volunteer who will be in the DR for 6 months and will write a history of the churches and schools as well as help with translation on mission teams. Patricia Martin and Charlie Nakash are invaluable help with office coordination and construction teams. The scholarship program for the schools needs additional supporters. Julius Ariail presenting the Communications report. Julius Ariail presented the Communications Report. Highlights of the report included the new use of Constant Contact as an email database for those interested in the DDG and its work; the latest issue of the DDG Newsletter, Compañeros Dominicanos, new features of the DDG website; and the parallel posting of DDG and DR Diocesan Facebook posts. He also presented two new projects that are underway: the online posting of the list of mission teams coming to the DR, and the online map of churches and schools with exact GPS coordinates. DDG Executive Director Bill Kunkle presenting his report to the board. DDG Executive Director Bill Kunkle reported that the DDG had received over 1000 donations from over 400 individuals in 2014. The church donations are combined from hundreds of individuals. This year we rebranded the DDG with a new logo, updated website, newsletter, Facebook page and Twitter site. As a result many individuals and organizations now view the DDG as a professional organization and are interested in becoming involved in the work we do in the DR. He described the travel he did in 2014 for our organization. He is joining the board of directors of the Global Episcopal Mission Network. He further explained that we received money from four grants in 2014. The technical and adult Education programs proposed include a language program, a computer program, a business program, health, nutrition and hygiene programs, first aid training, and adult literacy programs. After lunch the third business session featured the recognition of new members. Julia Ariail is the Bishop’s representative for the Diocese of Georgia and the Rev. Tar Drazdowski is the Bishop’s representative for the Diocese of Nebraska. The four committees worked separately for 30 minutes then reported. The Budget Committee chaired by David Morrow presented the 2015 budget for the DDG. He stated that the DDG had a 15-year list showing how much money it costs to send equipment and money to the DR. 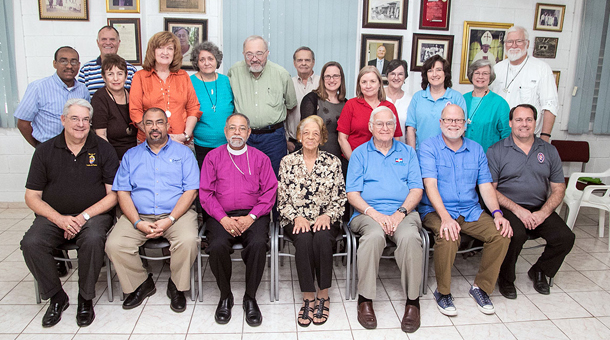 The Endowment Committee chaired by Bishop Ousley presented a motion to approve working with The Episcopal Church Foundation to conduct a capital campaign to benefit the Diocese of the Dominican Republic. The motion was seconded and unanimously approved. 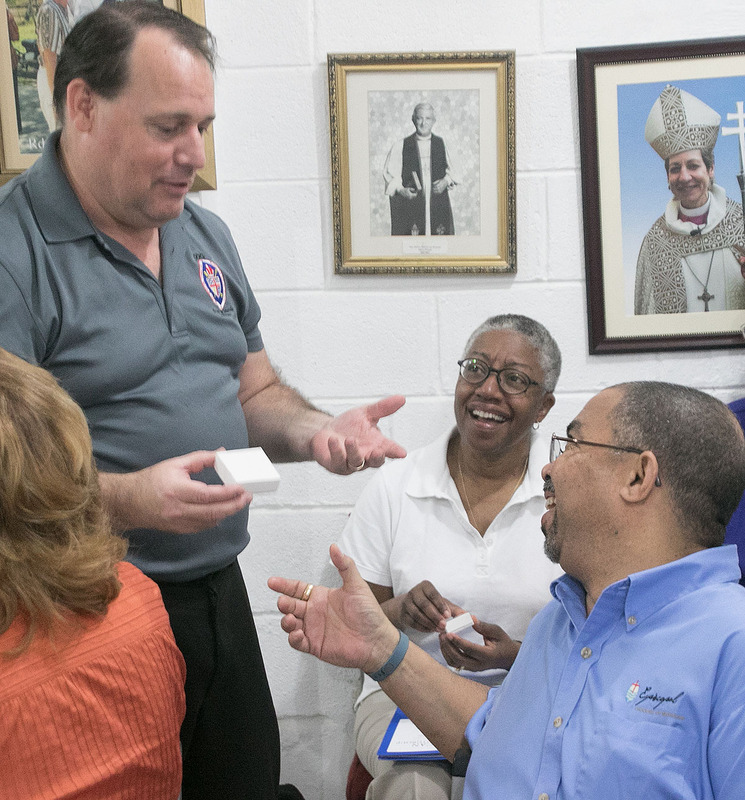 Bishop Ousley has scheduled a meeting at the March meeting of the House of Bishops for those with Dominican mission connections to discuss the campaign. From left: Bishops Gibbs, Smith, and Ousley during a break period at the DDG meeting. The Rev. Tar Drazdowski reported for the Water and Sanitary Latrine Committee. The forms to make the latrines are coming in June to the Dominican Republic in the container being shipped by the DDG. The first ones may be used in Angelina. The water systems’ first well will be in El Carreton. Along with the forms, the container will also deliver solar power panels that will provide a power source for the well. Mosavi will probably get the second well. 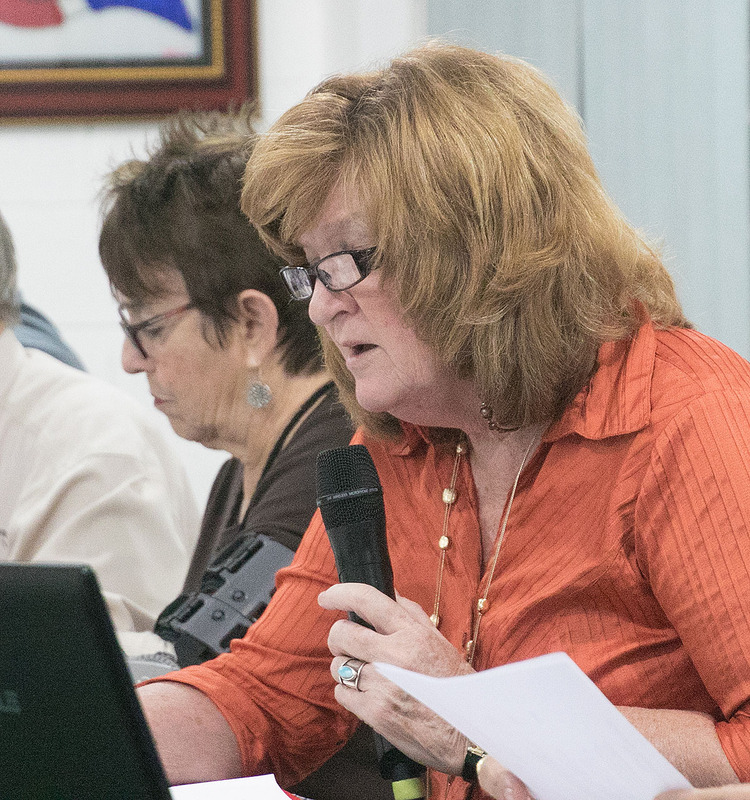 The fourth business session featured a presentation on a proposed community housing project. Bishop Holguín proposes building 100 houses for parishioners in the Episcopal Churches in the Dominican Republic in the next year. Bishop Holguín said this would be the best way he knew to celebrate his 23 years as Bishop of the Diocese of the Dominican Republic. The next meeting of the DDG will be in conjunction with the Diocesan Convention of Western Louisiana in October 2015. 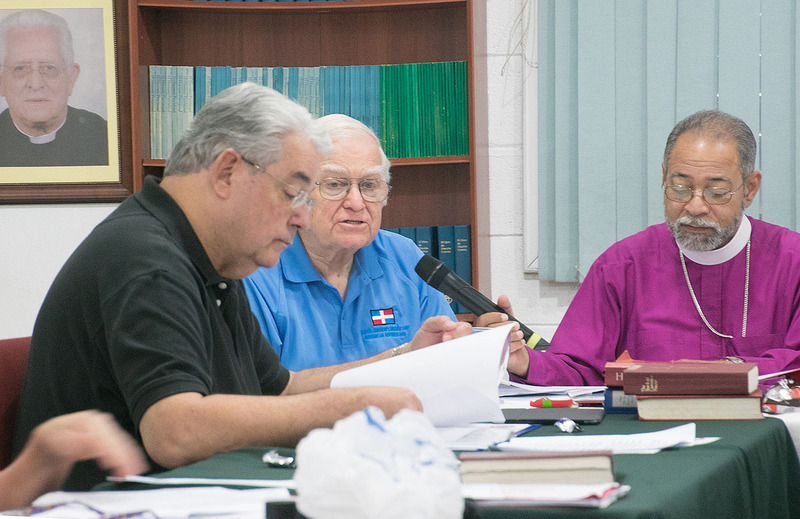 The next meeting in the Dominican Republic will be in conjunction with the Diocesan Convention of the DR, February 12-14, 2016, with the DDG meeting on February 15, in Santo Domingo. Bishop Holguín concluded the day’s work with a prayer, and President David Morrow adjourned the meeting.